CBS News’ new morning show, “CBS This Morning,” has debuted from its new home at the CBS Broadcast Center. The newly-constructed studio mixes modern, high tech looks with more traditional scenic elements. The show’s main anchor desk includes a round central section that has the CBS eye etched onto the shiny glass surface. The area is backed by a large video wall. Throughout the set, exposed brick gives the studio a contemporary, loft-like feel. 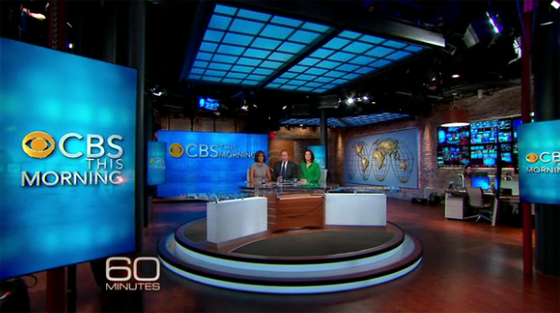 To the right of the video wall, the world map from the Walter Cronkite-era “CBS Evening News” set is mounted on the wall (a version also appears on the current “Evening News” set). Near this is another video wall with feeds that mirror exactly what the director sees in the control room. Situated in front of this is a small work area that includes some industrial decorative lighting. Another wall includes additional exposed brick and shelving that houses authentic CBS News memorabilia. Throughout the set, flat screen, vertically-mounted, nearly-edgeless LCD monitors are included. The studio’s floor is a warm wood tone, exposed brick walls and backlit ceiling elements carry on the loft-like feel. One element of the set, however, makes the set feel a bit too “real” — a rather distracting and unflattering “Exit” sign just to the right of the main video wall. Another interesting feature is the adjacent green room complete with glass doors and windows that overlook the studio area. Meanwhile, the show uses a light blue, sliver and gold color scheme to create a simple logotype.